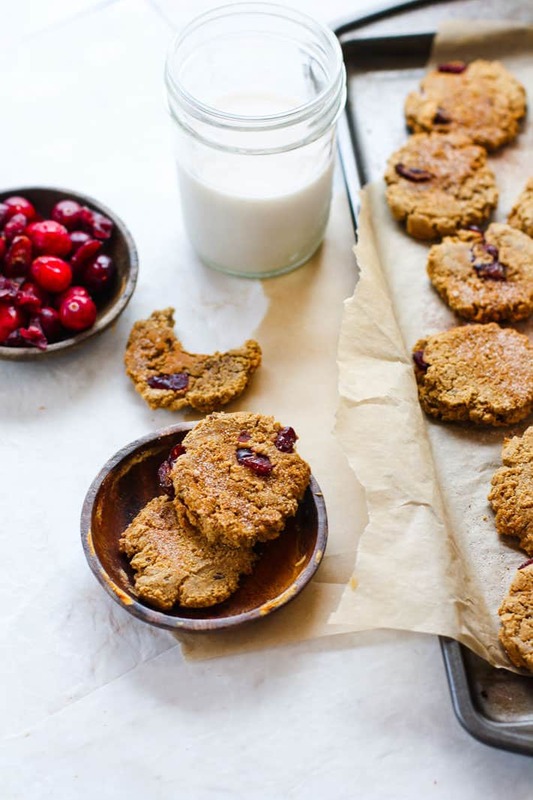 Vegan Cranberry Almond Molasses Cookies! These tasty molasses cookies are gluten free and dairy free! Great for the holidays, for snacking, parties, or even breakfast on the go. 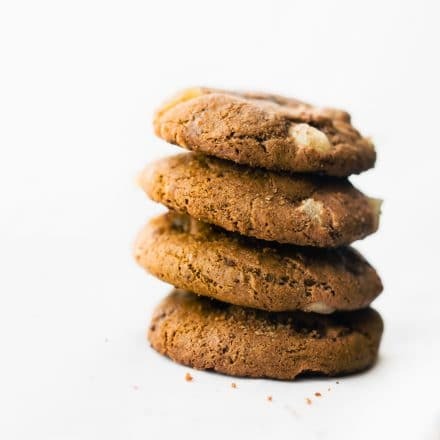 Yes, you’re allowed to eat molasses cookies for breakfast when they taste this good and are made with simple real food ingredients. ENJOY! Sweet Molasses it’s Thanksgiving week! Are you ready? Don’t worry, I got you covered with sides dishes and dessert if not. Mmm k? But really, I can’t believe how fast this season is starting. That being said, once Thursday is done, Christmas is in FULL bloom. Which means CHRISTMAS Cookies!! Am I too early? Nah. I guess, one can never be too early for holiday cookies. That being said. I made you Cranberry Almond Molasses Cookies. 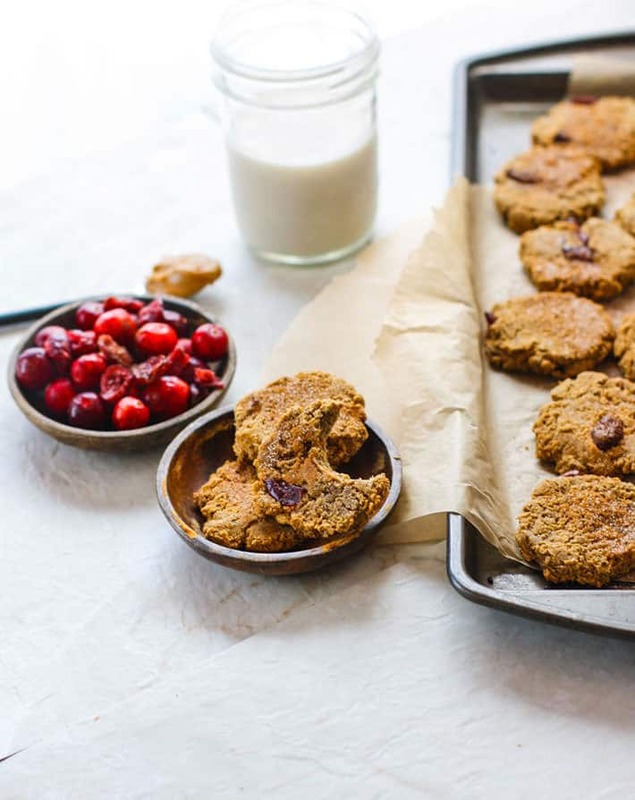 Yes, these are cookies you can make for the holidays but also, they are healthy for ANYTIME of year. Vegan and grain free. So if you have friends with food allergies or dietary restrictions to bake for this season, THESE WILL BE A LIFESAVER. I’m not gonna lie. 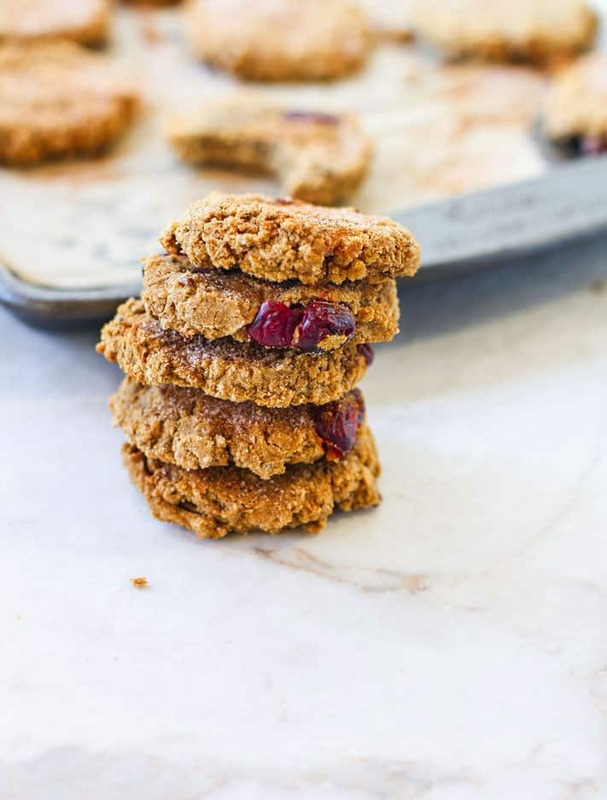 These cranberry almond molasses cookies would also make for some pretty amazing for fuel too. You could take them with you for post workout refueling (natural sugars/carb source) or even on long rides. Yes, I just said that. 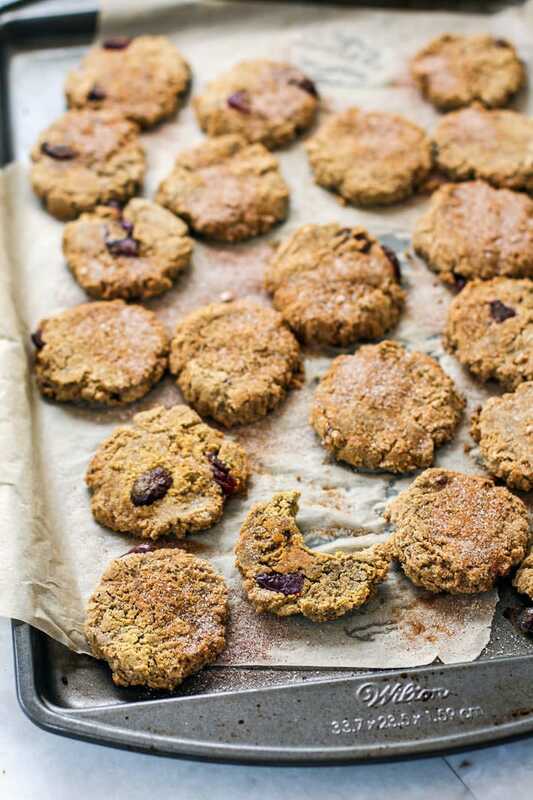 You have my permission to eat cookies for breakfast or for snacking and feel good about it. BUT …. 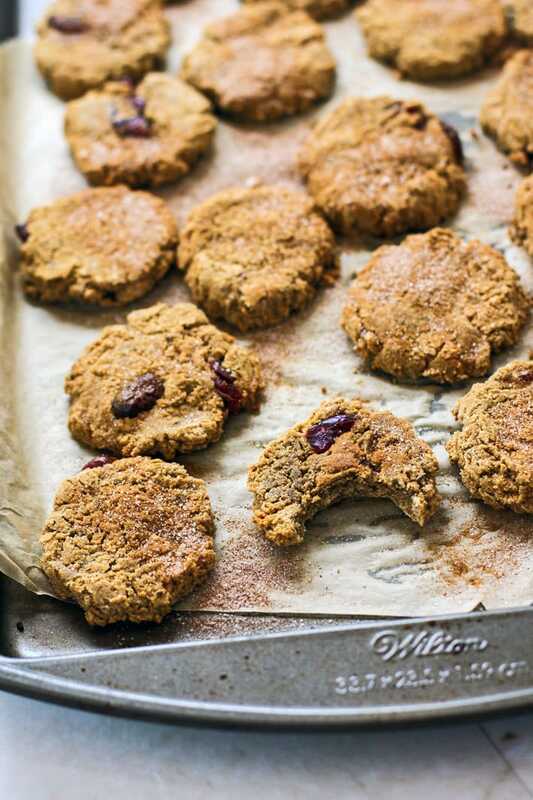 my main ingredient focus here for these cookies is sweet old Molasses! Turns out your grandma was pretty smart using this ROCK STAR SUPER FOOD ingredient all the time. Let me explain a little more about this wonderful real food ingredient. 5 tablespoons of molasses (preferably blackstrap) contains 95 percent of your daily allowance of iron. 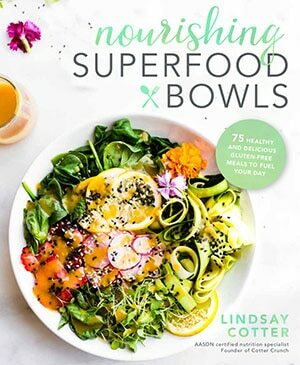 This is great for those with anemia or vegans/vegetarians who may not get enough iron in their diet already. 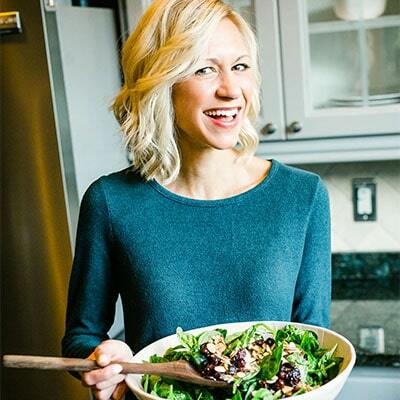 Too little or too much of iron can make you feel tired or weak, so consider this a good ENERGY balance for sure! And lastly, molasses is a natural sugar that is digested more slowly. Which can help stabilize blood sugar. So you see, snacking on these between meals can keep insulin in check! Sounds like a plan to me! I don’t really think you needed another excuse to eat holidays cookies, but just in case you did, I’ve supplied you with MANY above. Preheat oven to 350F. Oil a baking sheet or line with baking paper. Set aside. In a large bowl, mix your first 5 dry ingredients together. In another glass bowl, heat your almond milk for about 90 seconds. Then add this to your dry ingredients. Mix well and then add in your applesauce and nut butter. Finally add in your remaining extracts, spices, and fold in your cranberries. Let the batter cool in fridge for a few minutes. Remove then roll dough into 1-2 in balls and place on baking sheet about 2 inches apart. Press each ball down flat with fork or hand. Best to use with a little extra flour on the hand. Bake for about 20 minutes or until cookies are golden brown and no longer soft on the outside. Sprinkle with extra cinnamon sugar before serving if desired. Cook longer if you want the cookies to be more crisp or less if more soft. Check cooking time at 15 minutes to make sure. If you are using Gluten Free flour 1:1, the cookies will bake up to be more chewy and less crisp. Still delicious! The cassava flour we use is from Ottos Naturals. 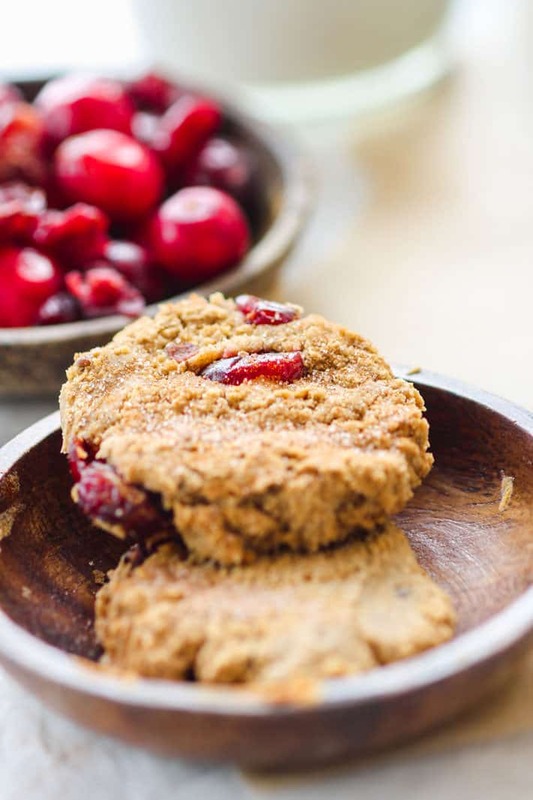 So much festive flavor (cranberry and molasses), add with a little healthy fats (almond butter), and all packed into one delicious Holiday cookie. Okay it’s a cookie you can make anytime, but you get my point. My point being that you can make anything fuel if it has quality ingredients. Heck, I’d even say that homemade real food based cookies are better fuel than a lot of packaged energy bars. You know, the bars with like 30 different weird ingredients. Gasp! Yes, I just spoke what’s on my mind. Although I bet you can agree, right? But here’s the thing. Cookies also go well with a beverage. So today you can raise your milk, smoothie, coffee, hot toddy (okay maybe wait till 5pm for that) and cheers to enjoying holidays! Phew! Okay, who’s ready to get your Christmas/Holiday baking on? Let’s do it! Favorite holiday cookie? Molasses fan or not? 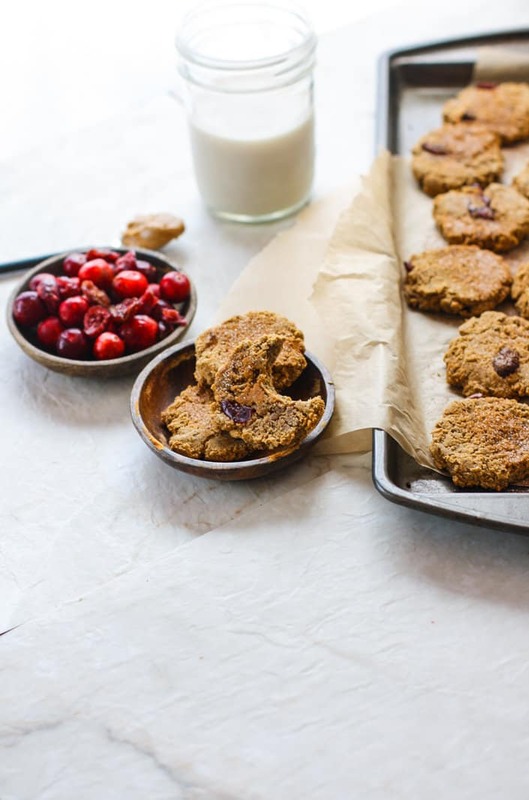 I don’t need an excuse to eat a cookie…holiday or healthy is just a bonus! 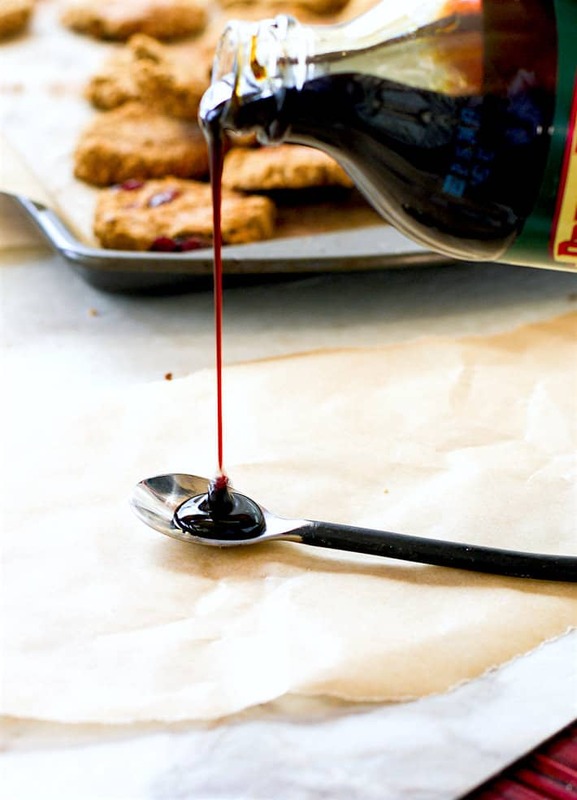 I love molasses but certainly do not use it enough! so true! now you better get to eatin more of it asap! LOL! Considering how much I love that sweet potato sunshine cereal, you better BELIEVE I’m a molasses fan! My only problem is that I wish I could buy a little bit less of it at a time. Like buying bulk pb or honey. What if I don’t need a gallon of it? I love molasses! I make a gingerbread cookie every christmas with molasses. Makes them so chewy! I need to figure out more recipes that use molasses! I did? yay! love you! so glad! and saw you used BOB’s 1:1. that’s a great flour! how was the sweetness? The sweetness was perfect!! I used 3 Tablespoons of molasses & brown sugar 🙂 My 2 yr old son gobbled them right up! I go through the BIGGEST molasses obsession every year starting around this time. I think one year I even managed to polish off an entire bottle of the stuff in a couple of months 😆 But it’s so tasty! 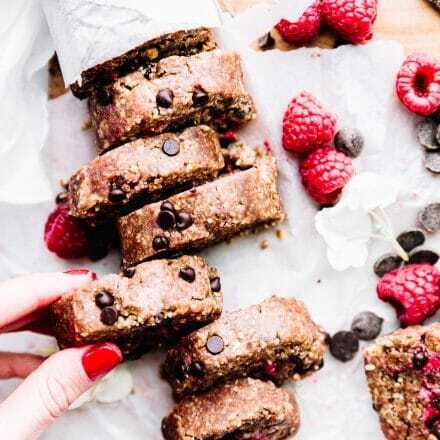 And I love what you said about being able to make cookies a nutritious snack with the right ingredients — totally the moto I live by. Ooh, brilliant! I am a big fan of molasses. I remember my midwife recommending molasses tea when I was pregnant for extra iron- just a spoonful of molasses in hot water and it was delicious! mmm i like that! i’ll have to try it next! Gahhhh I love molasses and Miguel hates it and I am convinced there’s something wrong with him. These photos are gorgeous Lindsay! With these fun facts about molasses, you make me feel a little less bad about myself for eating it by the tablespoon 😛 These look soooo delicious though, like I said, love my molasses! I STILL need to get my hands on the cassava flour. Love me some molasses. girl, you’d love! it’s so versatile! You are reading my mind with these cookies! 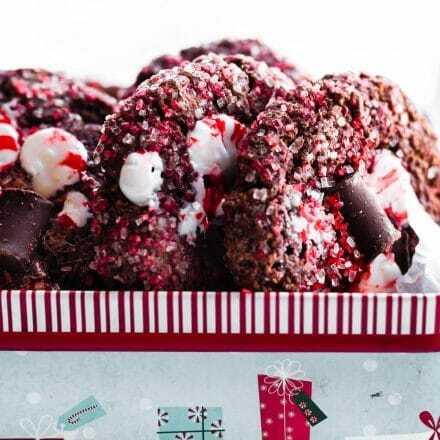 I have been looking for GF cookie recipes to try for the holidays and these sound right up my alley! All the holiday flavours! so glad! let me know if you try them! LOVE molasses! 🙂 these cookies have me drooling like usual! I honestly didn’t know that molasses was that healthy! 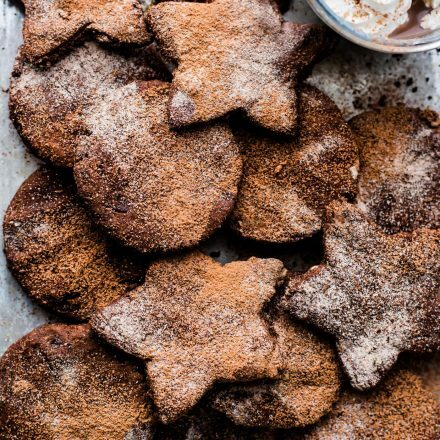 I need to try some – especially to make cookies like these delicious ones! 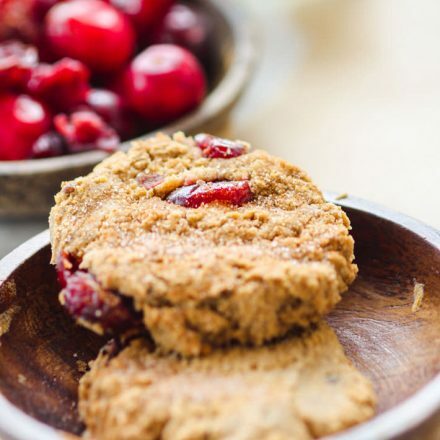 Love the cranberry and almond combo – yum! Gimme, gimme, gimme! I want all of these!!! Pinning! cookies are always a great idea and it is so much better than packaged stuff. Molasses is the new superfood! I knew about it’s great ability to help refuel after workouts but I didn’t know you could get that much iron from it! What a great tip!! And yes I can’t wait to bake all the cookies! These are certainly going on my list! I can always count on you to have the best gf recipes! Looks like another great idea for holiday gifts. That much iron and magnesium is also great for people who are pregnant and maybe not wanting to eat all the greens. You’re a genius. Did I ever tell you your almond mango bars helped get me through my first trimester? For real, I wanted virtually nothing and felt queasy all the time, yet those brought me solid food, a nice dose of vitamins and happiness. P.S. I want to do a post sometime in the future on legit super foods, not the marketing hyped ones. We should join forces. Because molasses is good for you, I use it often: on top of a sweet potato, oatmeal, nut butter on toast or with plain yogurt and fruit. I had no idea that molasses had that much iron! Very cool. Also, I’d gobble up these cookies. NOM. Super yummy and delicious. I love cranberry and these sounds just perfect! Okay! I have ALWAYS WONDERED THIS: wtf is molasses! lol! I know it’s a sweentener but like… WHAT IS IT?! can you use a different flour besides cassava flour? yep! cassava is a 1:1 ratio to most other flours. So you can use regular, multi purpose, etc. Made these cookies today for a vegan, gluten-free friend. Not sure what I did wrong but they looked nothing like the pictures. They are very dark brown and the consistency is more like a very moist and chewy muffin. Several people who tried them said they were delicious, but “wouldn’t call it a cookie…” This was my first time baking anything gluten-free. Any idea what might have happened? Totally understand! What flour did you use? And what type of molasses? Hey! Thanks so much for your reply! I used Bob’s Red Mill Gluten-Free Baking Flour and Simply Balanced organic blackstrap molasses. Gotcha. Ya, sometimes the gluten free flours have more xanthan or guar gum which made them chewy. Have you tried bob’s 1:1 GF flour? also the black strap molasses could make them dark. Hey, if they are good than that’s great! vegan GF cooking is hard. Let’s call them Mookies. Muffin cookies. Haha! Haha! Mookies! We were trying to think up another name for whatever it was that I ended up making and decided on “Molasses Morsels.” 🙂 Anyhow, they are definitely not Instagram worthy like your gorgeous pics but we love them (especially my two year old, we never let her eat cookies but these are loaded with good stuff so I’m cool with it), so thanks for the recipe! I’ll definitely be spending some more time on your site!